Right, here you all go. Be kind. Whoa. I expected more detail in costumes thanks to UE4, but not THAT much. Nice! Oh yeah. It's fashionista time! I'm deeply considering the fabrics of my uniform now! Looks great can't wait to see more, well done MWM! have you gone shopping for servers? the cheapest ones cost 600 us dollars. the best ones, much more. but overall vastly less than a decade ago. Hehe... I wonder what the Nightmare's glorious armor would be categorized as? Certainly not the Brooder or the Goody-Two Shoes. 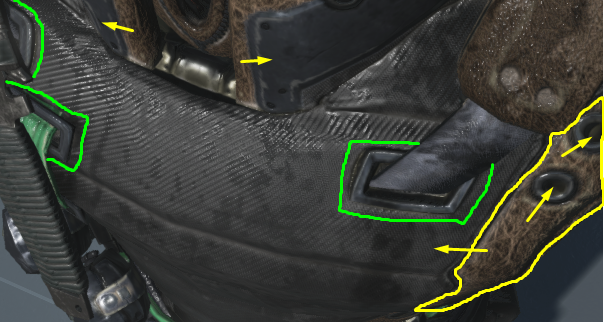 Even though the outlined Yellow areas (leather) seem to be a different Mesh, its not. Its the Same 3D mesh, which can be very important for a 3D engine performance, as 2 separate meshes, even if both meshes add up to the Same Exact amount of vertices's, takes up more graphics processing. So are textures and costume pieces separate? Cause if I can get that padded armour chest piece without the straps and I can change it's texture to human skin, I can probably make a pretty decent reptilian underbelly for a hulking killer croc type. This method also allows you to use lower resolution textures as well to improve performance on older machines. this realism allows spooky/scary areas to be possible. without mere jumpscares. I'm suddenly not so afraid that all the crazy visuals I've proposed for the game will be cut with a "sorry, we'd do that if we could, but..."
Heh, nice! I hadn't thought about the fact that this could be encouraging to MWM team members as well as us players. The only concern I have arising from this is whether the level of realism in the world and the costumes will require avatar faces to keep up in a way that pushes them into the Uncanny Valley. Looking fwd to seeing how you folks avoid this potential hazard. Just to be clear, are these merely examples to illustrate what MWM is doing with costumes or are those examples of the art/aesthetic we can expect to see in the game? Like Cinnder, I am not much of a fan of (ultra-) realism in computer games in general and for a superhero game in particular. Yea.. you could even give the Option(s) to Wrap the Text in XML with each NPC's Name/Gender/pitch level/etc. Will you allow us to sell costumes we've made to other players in exchange for in-game money? I'm thinking that costumes sold this way couldn't be directly edited, but with some effort, there's little reason someone shouldn't be able to imitate it through the in-game editor once they have a sample to copy from. I would love to be a designer that took commissions from other players to design a costume with a particular theme or feel to it, but they either don't have the eye, or don't have the time for it. Ohh, what about LOD meshes... and using a Diffuse Only shader when objects are far..
..so you can cut down on the GPU having to process Normal Maps too. I dont know exactly how much of the GPU is taxed when every shader has normal maps, but i hear its taxing. This has been discussed in a few places. I believe the general consensus is that it would be cool, although MWM would have to review and accept all submissions before they become available in the game. Segev, or perhaps DocT, had raised the possibility of requiring a kind of license to make such submissions. The idea is that even if the license cost a token amount ($10 range, maybe? ), the risk of losing it should dissuade people from making inappropriate submissions. Will be be able to start working with the character creator before the full game comes out? It looks very impressive. Yes. The hope is that the avatar builder will go into beta by the end of the year. As of a week or two ago they were still wrestling with a major technical issue (the character rig/skeleton). We are using super-high quality pieces here to show off the technology, what is possible, only. Stylized realism is something the unreal engines are very good at. Take a look at DCUO, it's a great example. That's the kind of realism we're talking about, ratcheted up a few notches because Unreal didn't spend all those years inbetween developing Unreal 4 for nothing. Realism that isn't, at the same time. Neatly avoids the issue. Also, from the Facebook page we now know that they're aiming to make the AB available in December (in case 'end of the year' was too vague). And thanks to those who venture into Facebook to get this information for us. The Ballet of Death I am ten foot tall and bullet proof, I have a huge ax dripping from my enemies blood. I can breathe fireballs and lightning bolts come from my eyes. Even without that I can still bloody beached you with a ballet kick. I am a real man and real men were tights. I do not need to hide behind some, sissy, girly boy armor. Nice job with the armor. I hope we get color sliders to determine the colors of the costume the problem with multiple textures that they do alter the colors when applied with a palette. Sometime we can get away with using a darker or lighter color then the one we had to try to get a match. But usually with CoH the color would not be quite the same sue to the automatic shading of the texture effect. I am ten foot tall and bullet proof, I have a huge ax dripping from my enemies blood. I can breathe fireballs and lightning bolts come from my eyes. Even without that I can still bloody beached you with a ballet kick. I am a real man and real men were tights. I do not need to hide behind some, sissy, girly boy armor. The editor in me is unsure whether he wants to kill it with fire or be content with a mere facepalm. Hehe... I wonder what the Nightmare's glorious armor would be categorized as? A friend told me I'd be one hell of a lackey once. * This being a superhero setting, and those being what they are, I feel the need to add a disclaimer about villains who turn their minions into the undead, or find other ways to reanimate or reuse ex-minions. I'm sure the folks at MWM will be doing their best to avoid the pitfalls of the Uncanny Valley. For what it's worth I'm somewhat willing to tolerate a bit of the "creepiness" in what Darth Fez calls "ultra-realism" in the latest computer games because I realize the technology will eventually move past the rough edges associated with it. As the Uncanny Valley graph shows once you move past the low point the degree of acceptance/believably in these things shoots rapidly upward. My thinking is that games made in the next 5 or 10 years are just going to have to suffer through some of the growing pains of the Uncanny Valley before we make it through to the other side. Basically we may be worried about Uncanny Valley issues now but by the time we're playing games based on say things like Unreal Engine 7 or 8 the detail of the tech will be so advanced it'll all be a non-issue at that point. Realism that isn't, at the same time. Neatly avoids the issue. I think the term you're looking for is "verisimilitude". The goal isn't to be realistic (because that will become outdated and odd-looking as technology advances), but to have a style that feels real (so that we can easily suspend disbelief). Not just sliders, but number boxes where we can type in the exact shade we want. And we need to be able to switch between RGB and other color spaces. By all means have a simplified interface by default, but let us costume junkies have maximum control. I'll also mention that we need to have some control over the lighting in the costume creator. I want to see what my costume looks like in office lights vs full sun vs cloudy day vs twilight vs street lamp. If I recall correctly, in the Unreal Material/Shader Editor.. if you hold down "L" (for Light) and while held down, you can move the mouse around and the Point light would follow the mouse. Ah, ok, so this is strictly a tech update, and MWM has yet to unveil art style. Makes sense to me. Talk about your appetite wetter! Well I just looked over all the comments and I'm curious about this technical issue someone mentioned. Is it something that has been overcome yet? Is the character creator still going to be available by the end of the year? Will we be able to have a guy with wings and still give him a cape? For all the uncanny valley people, maybe would could see a preview of some faces? Or would that be showing too much at this point? I just showed my 13 yr old the pics of the textures & colors. She smiled broadly & stated it was CoH 2.0. A major aspect of CoH for her was the character generator. There were days she would log onto my secondary account & just design new toons. I also like to layered allowable aspect of the costumes for CoT. For me personally, I like the animation to be pretty lifelike. I absolutely hated the look of everything on Champions Online. It was like a Filmation drug induced nightmare. The movement of the toons on there was also very disturbing. Oh dear... as if I didn't spend long enough in City of Heroes' costume editor to get costumes just right. I could spend an entire evening just tweaking costumes and now you do this? You seem to be thinking of a completely new costume item modeled from scratch, which while it would be cool, I agree it would also need an approval process. I believe Sony has something similar in Planetside 2 already. I was thinking in terms of just using existing in-game costume resources to make a full costume, but for other people. The customers would just be buying the time and effort to assemble the ensemble instead of spending their own hours in the character creator. Nothing inappropriate would be possible from this outside of what is inherently possible in the costume designer. In CoX, you could design a costume, but it was only for personal use, and not available to be transferred directly to another player. I vaguely remember copy and pasting costume code, but that hardly seems like quite the same thing, and it destroyed most of the convenience factor. Oh, you mean that for each costume that you create the AB could export some kind of code or hash tag, and if other people input/paste that code into their character creator they get precisely the same costume? That idea has also been floated once or twice, and I think most people would be in favor of that. Well I just looked over all the comments and I'm curious about this technical issue someone mentioned. Is it something that has been overcome yet? Is the character creator still going to be available by the end of the year? They're still working on the technical problem. If they've resolved it they haven't spread the word, yet. For now the December goal for the AB (at least a beta version) still stands. Actually, ya know, he might have said I make a terrible lackey. Being a mere lackey, I didn't feel the need to pay attention to all the details of what he was saying. Hell... Even just being able to select surface type (i.e., metallic, shiny leather, leather, shiny cloth, dull cloth, etc.) to change the way that light reflected from the surface for costume pieces would have me tucked away in the tailor shop for weeks; getting to tweak surface textures for closeups, too, is incredible. Amazing what moving up a couple generations of game engine will do. When I look at the armor it seems to have a few different texture types in it if we apply different textures would be able change sections of it for each of the different texture parts. I was wondering and hoping we could have realistic furs, as per this season's vogue magazine, if you needed references for hoods and such things there are many lovely high resolution options. I know, it does require more mathematics and splicing especially if we want them to be pixar-realistic with longer furs, shorter ones should do okay as they wouldn't be expected to move much, like velvets they would more or less stay in place, but they have a longer light scatter field than satin. I was also wondering about metals and satin. Metals are shiny, chromatic, they should reflect their brightest color at the correct angle in sunlight or other bright sources of light. Copper, Brass, Steel, Nickle, Glass and Aluminum are most likely to be encountered in an urban setting and they are all extremely reflective. Most games and movies never do this. Satin does the same thing but it's more scattered, instead of a solid flash of light it bends in a distribution over a shoulder. Those dresses with large bits of glitter stuck to them do this as well, but much as an intermediary between both Satin and Metal. Water does the same but again only at the correct angles, too shallow and you just see the ripples of water on the surface of a lake, or the length of a still pool. Too deep and you see into the bottom of your lake, and the marble bottom of your pool. I will point out right now that all knives and blades have a second angle of reflection on them and that is along the cutting edge. If the blade is dull it does not shine when reflected in the light at the correct angle, as if one was using some skill or visual appreciation to appraise it's value. Another thing about lighting, at dawn the sun gives out warm orange colors, in the afternoon it becomes a golden yellow, and by dusk it's red and purple in it's sunset light. The moon by contrast is more of a calming blue soft light. Oh and quick introduction :) I'm Diana Smith but you can call me Skaldi, 22 years online gaming experience, 20 years of game suggestion experience, 7 years doing the same for various American companies. Imaginitive young lady looking for clients, talents are imagining the realistic possibilities of practically anything, and applying new technologies to practical applications in all types of business. If I'm not mistaken Unreal Engine 4 can handle fur "textures" for characters pretty well. This'll be good news for all the catgirls and werewolves and such out there. Maybe as a compromise characters would be free to wear fur in this game as long as they are constantly followed by a posse of PETA protester NPCs waving signs like shown here. I support PETA (People Eating Tasty Animals)! I like Leather for Jackets and Belts and Shoes. My sheepskin slippers, with the fleece on the inside, are the most wonderful gift I ever got for me feet. And there are rare and endangered creatures out there, that should not be killed-off, just because their parts are attractive. There's nothing wrong with the 'Ethical Treatment of Animals', except that many of the People involved don't bother to learn anything about the animals. They aren't cute and cuddly. Sorry, didn't mean to start a debate for people on whether to fur or not to fur, I see it as lovely costume fur, and an elegant way to dress a fictional character in a game, thereby satisfying a personal need to feel sophisticated and elegant. I would honestly rather pay $15/mo on a video game subscription where I could dress up in several different furs and enjoy it. The real ones, and I've owned two in my lifetime, rabbit fur earmuffs given to me at the age of 8, require excessive maintenance to keep them good. You have to buy lotions, be careful where you put them, how you hang them up, airing them out every few months, protecting them from moths, heat and moisture, cleaning them, brushing them out, checking the leather backing. It's a real fuss to keep them looking nice! Maybe I'm saying I'd rather be lazy and wear a grouping of pixels instead. The good thing about furs in real life is that they are a practical solution to winter winds. You know, the -60 windchill ones that rip through a regular cloth coat and your clothing like you were wearing nothing but toilet paper, and give you frostbite between getting out of your car on the thruway and replacing that flat. Sorry, didn't mean to start a debate for people on whether to fur or not to fur. You certainly didn't start this debate in general. I think we're just pointing out the cynical fact that people will find almost anything to complain about if given half a chance. Ironically having to consider the "question" of fur in a game like this is only possible now due to the technology for rendering realistic looking fur in computer graphics. As little as 5 or 10 years ago you couldn't even generate reasonable looking hair/fur in games so we didn't have to worry about silliness like this. 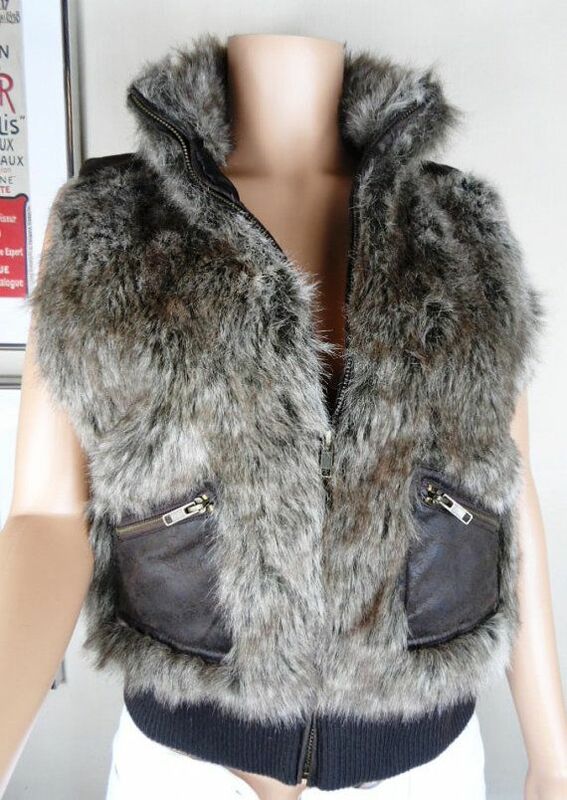 I suppose the folks at MWM could choose to avoid letting us have anything that would look like fur-based clothing for fears of upsetting people in a "virtual" world but ultimately I hope that isn't the case. I might not be personally interested in fur clothing for my characters but I support having as much clothing option freedom as possible. As soon as you start censoring things for esoteric philosophical reasons you open up the slippery slope for all sorts of items to be restricted for all sorts of subjective non-engineering based reasons. As to the setbacks...that has to do with the character rig on which our avatars will be built upon. MWM was a little too ambitious with the amount of sockets the character rigs could hold and to how many pieces would make up the rig, and where their seams connected the pieces together would look and work in their game engine. Some of the seams did not move properly once the rig was in motion. Too many sockets used up too many resources leading to instability. It is my understanding that they are on the third iteration of the character rig. Once all the kinks are worked out progress will proceed. While this sets back the avatar builder somewhat it does not affect other portions of the game such as the background world building, lore, or art assets being created. There are multiple paths all being worked on simultaneously. Have no fear there. I have plans. 'round these here parts we call dem dere statements an oxymoron. Dunno how oxen an' morons done got involved, but that's what we call 'em. Dr. Poole was right! You're an ox AND a moron! One of Stallone's better movies, IMO. And who doesn't love Tim Curry? I got started, in another topic and then I realized I'd gone off topic again so I clipped out the clothing part of my post and here it is! I remember when I played Archae (another mud) for a while, then they closed for maintence for a few years but I teamed up with someone who could submit clothing patterns to QC, and I actually designed a pink scarf with white and red alternating hearts woven into the end, and a couple of other things along that theme and they were approved into the game immediately no wait time at all. They said I had good taste or something :) The very limiting part of Archae was that the number of pre-set items were just that they were pre-set basic things like gloves, scarf, hat, but you couldn't specify 'mitten' or 'wings' or anything specific like that, and you couldn't embroider craft something you had just made. Embroider craft items had to be NPC purchased, which I really felt just through another limitation on the player. You can have enchanted embroidery crafted clothes but it has to be from the NPC, or you can have beautiful decorative custom clothing but it can never be enchanted. I was disapointed because the next class I wanted to play was a wizard with a very fancied up robe and then get it embroidery enchanted with a good protection spell so I could wear it in combat as if armor. Dragonrealms did eventually code in enchanted embroidery but you couldn't ever make your own decorative clothing within a week, in Dragonrealms system it was pay up $50 have a personal event and get all the clothing customization you want up to 20 items, they would code it from scratch themselves and it would be fully decorated but it had to be something again from an NPC shop. The other alternative Dragonrealms gave was they would have an event with an Alterer, and the Alterer could change the look of any item in the game, but again long lines and waiting all day for something nice. In that I greatly appreciate CoX and CoT, make it yourself, and enchantments are your powers. But what I'm asking for I guess is embroidered patterns and beads that you can find and then place as you want on your costume? Hearts, stars, moons, crescents, snowflakes, bells, teardrops, animals, cat's eyes, gems, pearls, diamonds, jingle bells, wings, quarter notes, spoons, outlined triangles, squares, hearts, stars, teardrops, circles, round badges, numbers, and of course you have to be able to color them individually! Okay it's past 5 am I need to sleep.